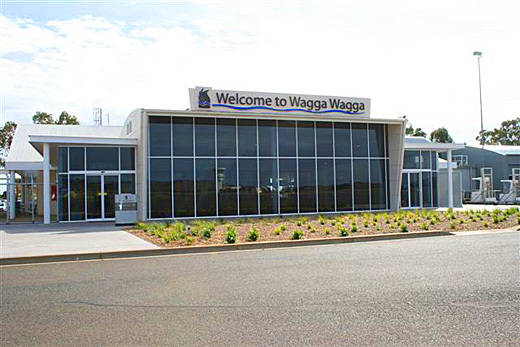 One of the things we loved about our first trip to Wagga – and one that we found very bizarre – was the airport. And with Lisa away in North America, I get to write another post without her about anything I want. For a variety of reasons, I have chosen the airport. First, I decided to write about it because I cycled to it this morning – it has been pretty hot here this week, so I didn’t get out any afternoons. And construction near the uni means I can’t ride to work. So I went for a long (53 km) ride on Saturday morning that involved the airport. The second reason it was on my mind is that Lisa is away – so she flew out of, and will be coming back to, this airport. But the third, and most important reason for writing about it is that it has been in the news a lot this week. In 2009, Skyscanner (whoever they are) came up with a list of bizarre airport names. This one was on it, along with other Aussie airports such as Useless Loop, Woodie Woodie, Wee Waa. Batman, and Moron. Too bad they didn't know that it is actually closer to Gumly Gumly than Wagga Wagga. 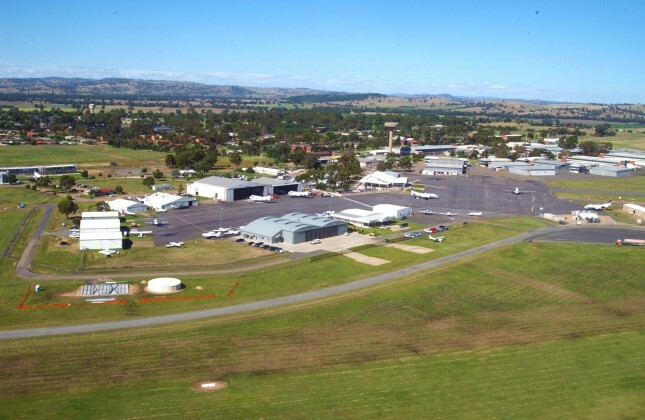 The Wagga airport is about 12 km out of town, in a suburb called Forest Hill. It is owned by the RAAF (Royal Australian Air Force) and leased to the city. The air force still uses it a lot, because they have a base in Forest Hill. About 215, 000 people board/get off planes in Wagga each year (compared to about 6 million in Edmonton). So it is a relatively small airport. Qantas and Regional Express fly in to it; they each run 4 or 5 flights per day to Sydney and REx has another 2 or 3 to Melbourne. That’s it, in terms of commercial flights. There is some private stuff, some cargo, and some military, but really we don’t see a lot of planes in the air here. To put the size and use into perspective, there is one food place there: it used to be run by Mick’s Bakehouse, a local pie shop, but they didn’t think it was worth having so the airport is running it themselves. And the Avis car rental is run from town – someone from the office here goes out when there is a plane coming in. It isn’t really a high-turnover place. When you do a Google Image search for Thirsty Crow, photos from our blog come up! When you search for Wagga airport, you get a bunch of random crap. Maybe that will change after this post. There are major changes coming, and ones that Waggans don’t really like. The first of the changes is that they are going to start charging for parking. Up until now, it has been free. Just pull up on the field, lock up and take off… But they say things are getting a bit crowded so they have to start charging. Rates: first hour free, $2.20 an hour after that up to $11 for day, and max $55 per week. Sure this seems like a big increase, but compared to other places it isn’t outrageous. Edmonton, for example charged about $4 for the first hour… And land isn’t free, so people need to pay. The problem is that it might actually be the first paid parking in Wagga. Currently, on-street parking in the city, including the CBD, is free. So are off-street lots. As is parking at the university (which is a real salary bonus for us!). “Restricted parking” means park between the lines…and they haven’t even implemented that on most streets yet. So the idea of paying to park where there is a lot of open space just seems wrong to Waggans. And sure, maybe the cost is a bit high, but I’m sure they have crunched some numbers and figured out what is needed. 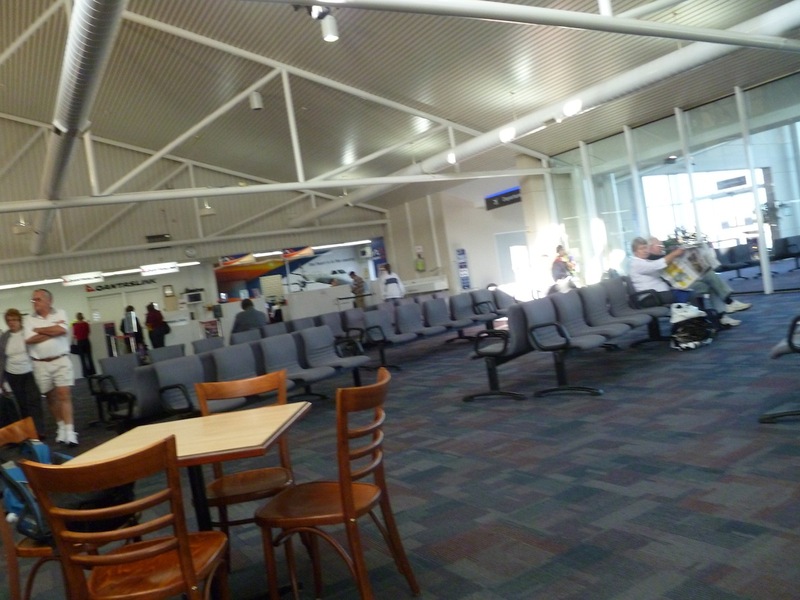 Because the SOPA/PIPA laws in the US haven't passed yet, I can take a chance on using this image of the inside of the Wagga airport, taken from Wikipedia, and not worry about being charged with anything yet. The second change is that they are getting real security! There will be baggage x-ray, a separate waiting room for people cleared, etc., just like a real airport. And we understand this. Airports are federally controlled everywhere (Dan thinks they should be run by the UN as neutral territory…) and they should all meet certain standards. But we’ve probably flown in and out of more airports than most Waggans, so we get it. So this will affect us – mostly Lisa – a bit. We will have to figure out how long it takes to clear security here! And we have visitors coming in the next few months so will have to make them aware that they can’t take a bomb back to Sydney. But otherwise, we are just glad we got the cats processed through Wagga airport before it got serious. This entry was posted in airport, Edmonton, Qantas, wagga, wagga wagga. Bookmark the permalink. Hi Dan, the whole parking issue is a big one. When I was in the US last time and was telling people that to park at Sydney airport is $55+ per day, people nearly had heart failure! Some places in the CBD are $28/hour to encourage mass transportation use.